Are they called ghost towns because they are occupied by ghosts? Or is the town itself the ghost? There are no ghost cities. Once abandoned, the towering buildings stand and rot, growing more vines than cobwebs. In the heavy, unethereal silence, the streets are slowly strangled by the growth of trees, becoming nightmarish in their very claustrophobia. When a city is left bare, the void is not filled by ghosts or even ghostliness. It is filled by monsters. Grey took a soft step forward. Moss depressed silently under his feet, and a low groan sounded from the heavy concrete over his head, but he didn’t wince. Tree roots, careless in their pursuit of life, had snaked roughly into the foundations, compromising them. The whole thing would come crumbling down soon; he could only hope that it didn’t do it while he was inside. With four hours till nightfall, it was worth the risk. He took another step, heart pounding softly as the building groaned again, and saw what he’d come for. The pair of does were young. They stuck close to each other, stepping over the grass-and-moss-covered ground with dainty feet, soft-furred, dark-eyed and thoughtless of the danger. Or maybe they were hungry too. A thin tree, already weakened by having to bury its roots in the unforgiving concrete, was growing wispily by the crumbling wall. Its thin, pale branches thrust through the window, searching for sunlight. The boughs jerked helplessly as the deer began tearing its leaves away with their all-too-efficient teeth. Grey sank slowly to his knees, keeping an eye on one of them. Just one. What he wouldn’t give for a rifle. The pistol in his hands was old, if well cared-for; and it had little forgiveness for his occasionally wavering aim. Grey lowered the pistol in surprise, blinking as he tried to see the world beyond his sights again. He hadn’t fired. The deer made no noise of pain. Confused, it tried to run, but spun in panicked circles as its companion gave a terrified snort and fled, leaping over Grey on her way to freedom. The doe stopped, wide-eyed and trembling. Fell–gently, as though she half-believed that she was simply lying down. Then she was dead. A brown-feathered arrow stuck out of her ribs. 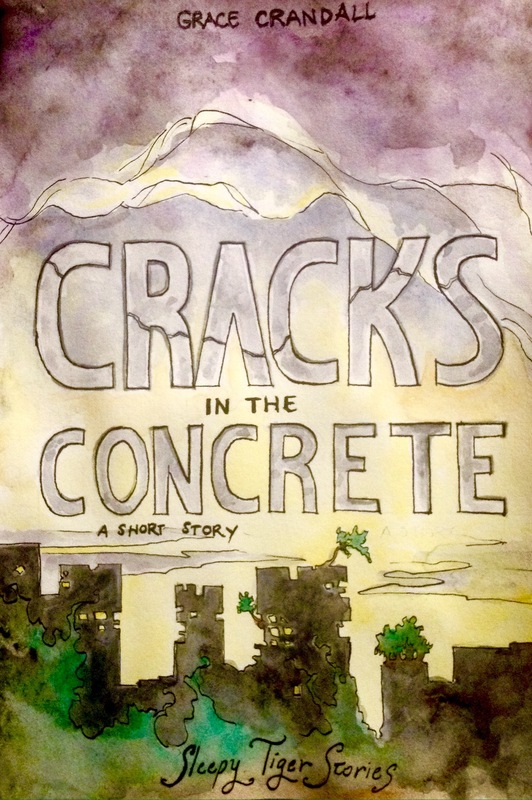 The building groaned again, and Grey crouched low to the ground as someone laughed. Then the someone was there, yellow-haired and gangling, pulling themselves free of a patch of scrub mere feet from where Grey himself hid and walking over to eye the corpse appreciatively. “Nice shot, Farwell!” he called over his shoulder, in a voice as bright and unwieldy as his figure. “My thanks,” another voice, also close by, and accompanied by furious rustling as the speaker tried to free himself from stubborn underbrush. The first boy grinned. There was bow in his hands, arrow nocked to the string. He slipped the arrow into his belt and looped the bow around his shoulders, drawing a knife in their place as he stepped towards the carcass. He knelt, studying it, and held a hand over the creature’s nose. The rustling renewed its energy by way of reply, and the yellow-haired boy glanced up, amused. “Do you need some help?” he said. There was a loud snap, and another figure stepped free of the bushes, bow looped over his shoulder. He was trying to get a tangle of stickyweed out of his dark hair. The boy kneeling by the deer raised his eyebrows. “No. Keep your meat here, deer, we need it to live,” the blond boy said, addressing the still figure on the floor. The blond boy rolled his eyes and snorted unappreciatively. “Just–take a leg–” he faltered, face stiff in an attempt to enforce a little seriousness. Wheezing, the blond boy bent over the body of the deer. “Shut up and help me,” he managed and Farwell relented, albeit with a cocky grin. Gutting the deer was a messy business, made messier by Farwell’s unhelpful good humor.Grey watched from the safety of his pillar, fighting with his own mind. The pistol weighed heavy and warm in his hand, and the stink of entrails carried a similar weight in the damp and motionless air. Both brought back unwelcome memories. The boys’ sharp joking and choked laughter were unfamiliar, foreign. Grey had half set himself to edging away, quiet and unnoticed, to escape the strangeness of the scene, but he stayed, watching. Listening. Not sure why he wished to do either. It was the deer, he thought. He’d taken the majority of the day to track and follow it. Three and a half hours till nightfall. A little more hunger, and his arms would weaken, his hands would shake, and his chances of surviving what lingered in the dark would be cut to a third of what they were now. The boys were so young. So seemingly innocent. He stepped out from behind the pillar, holding the pistol doubtfully, as though it were a shield and not a weapon. Farwell, between jokes and preoccupied in wrestling the deer’s innards free of its carcass, took the longest to notice him. The blond boy looked up when the building groaned, intending to make sure the ceiling remained where it belonged. He never got around to looking at the ceiling. His eyes were caught halfway to their goal, on Grey, and on the gun in Grey’s hands. There was a second of silence as they stared at one another. Then one of the blond boy’s hands went questing, bumping against Farwell’s shoulder, and he looked up as well, grin on his face faltering into an odd kind of blankness as he looked from his companion to Grey. He stood, red up to his elbows with the gutting knife still in his hands, and Grey kept the gun trained half-heartedly on his unprotected chest. Behind him, the blond boy was still crouching, but with one careful hand on his bow and another reaching subtly for the arrow in his belt. Grey had been hoping, foolishly, that they would take one look at the gun and run. But of course they didn’t. It wasn’t only the potential loss of two precious bullets that weighed on Grey’s heart at the realization. There was a clean-edged silence as the parking garage groaned again, protesting so many figures weighing down its abused frame. Unexpectedly, Farwell smiled at him. “Hello, stranger.” There wasn’t even a hint of wariness in his voice. He glanced at the gun–in a cursory, unfearful way that set Grey back a step–and then at the deer on the ground. He rubbed the back of his neck, a ridiculously boyish gesture that lowered Grey’s defenses farther than any words could have. And we beat you to it, hung unsaid in the air. The yellow-haired boy was gripping his bow as if to say, and it’s ours now, so back off, old man. Grey nodded, trying to steel his muscles into raising the pistol, calculating which of the boys to drop first. Somehow, his arms didn’t want to respond. It was the heat, he thought, making him sluggish. His face was as honest as an idiot’s. Grey could only blink in response. Golf looked as surprised by Farwell’s statement as Grey was. He looked on the verge of disagreement for a moment, but slowly, his hand relaxed its grip on his bow, and Grey could only lower the pistol in response. They finished gutting the deer, and Golf’s mood improved considerably when Grey offered to carry it. The building groaned in relief as they left it. From the outside, it looked like even more of a monstrosity than from the inside. With the headache-inducing weight of the doe bearing down hard on his shoulders and its blood seeping warmly into the cloth of his shirt, Grey spared a glance behind at the overgrown thing. Green vines were overtaking it, snaking through the old stone and half-withering in the heat. The whole building would come down soon, crushing whatever was still inside; but then the trees would come and grow over it, like they were already growing over everything else. The deer was heavy, and Golf impatient. Grey turned away again before he could decide whether he liked the picture in his mind–of a city fallen to pieces and a forest growing alive and well over the top of it. The streets had moss and saplings encroaching on them, but they were streets all the same. A dead traffic light, dark against the twilit sky, leaned crookedly over the intersection, a bird’s nest sitting atop it like an ill-conceived hat. Yellow-painted lines stained the hard grey ground. The tops of the buildings–the ones that still stood–were green with foliage and gold with sunset. The air was thick and damp. “Much farther?” Grey asked, the deer on his shoulders weighing more than a man. “Not much,” Farwell replied, and Grey gritted his teeth. It was only a block later that Farwell turned down a ramp, and Grey stumbled after him. As brick walls rose on either side of them, the hellish heat began to abate a little. The ramp led down into a cool hollow beneath a thick old building, somehow still standing strong in spite of the years and the vines. A cook-fire smoldered in the deepening shadows, and Grey dumped the deer beside it gratefully, breathing hard and blinking past the sudden dizziness. “Welcome to the camp!” Golf announced, giving him a slap on the shoulder that, like the words, was too sharp to be truly friendly. Grey responded with an ironic smile. Farwell was looking around the camp doubtfully. “I don’t know. I got here the same time as you,” Golf said. “Or maybe one of you could look around for a change. I don’t hover around the fire all day, you know,” a voice–a woman’s voice–said, and Grey turned around. Tall as Farwell, with a wild mess of dark hair tied behind her head, she was walking down the ramp with all the grace of a deer, one eyebrow raised with Farwell’s humor, and a gentle smile gracing her lips that was all her own. A rifle was slung over her back, and she carried a jug that sloshed heavily with each step. Golf went to her, taking the jug and planting a gentle kiss on her lips. Farwell gave them both a crooked grin, but Grey looked away, turning back to the dead doe, which needed skinning yet. Somehow, he had forgotten how to begin about the business, and he was standing, knife in his hand and staring down at the dead thing, when Golf plunked the jug of water down next to him. “We brought back a deer,” he told his wife victoriously. “And a guest,” Farwell added, kneeling by the fire. 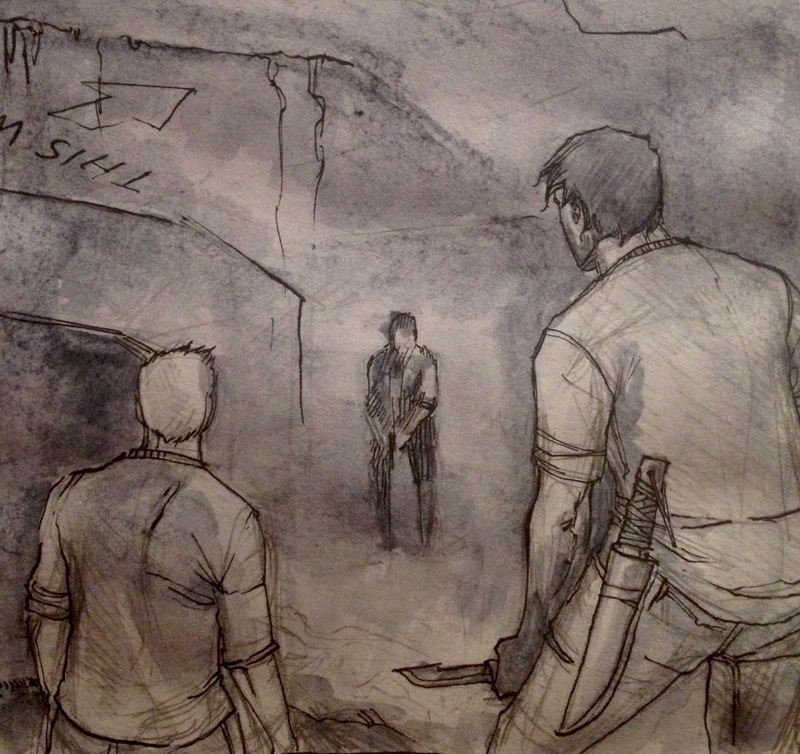 Out of the corner of his eye, Grey caught the slight nod aimed in his direction, and he turned around, hurrying to return the unused knife to its sheath. Christy looked at him. There was a sharpness, a wariness in her eyes like Golf’s, but her smile was as sincere as her brother’s. And then she moved on, taking over the stoking of the fire as Farwell and Golf moved to skin the deer, working together with practiced efficiency. Grey quickly became useless. Limbs worn and weary, he sat, leaning against one of the pillars that supported the building. His skin prickled uncomfortably, the blood that had stained his shirt slowly drying, leaving the fabric stiff and sticky. The smell of it was sickly, but not unfamiliar. Grey had not lived through the aftershocks of the end of the world for nothing. They said, when the cracks had appeared in the thirsty soil and the green things disappeared, that it was Man’s fault. But when everything was dead and the world was reduced to rock and sand, whose fault it was had somehow…ceased to matter. The horrors of the Dust Age, though, had been everyone’s fault. He remembered it too well. A world where food and water alike were scarce, where everyone was an enemy. You became as hard and dead as the ground beneath your feet and survived, or you…didn’t. He was very good at surviving. But somehow, along the way, he’d forgotten why he wanted to. The air was still thick and over-warm, but the suffocating power had gone out of it. Though the sky was still bright as day, the cook-fire was casting flickering shadows over the brick walls that surrounded them all. The meat that was cooking over it smelled like heaven. “Think the dogs’ll come tonight?” Farwell asked, breaking the relative silence. He was looking up the ramp thoughtfully, and Grey followed his gaze. The sizzling meat was distracting. Grey’s stomach felt like a hard-edged pit. Farwell turned away from the darkening ramp, eyes troubled. “We’re easy prey?” Golf suggested, and Farwell responded with a snort. Grey was listening more intently now, and he didn’t realize that he planned on opening his mouth until he was already speaking. And Grey was old enough, stained enough, to remember the breeding. Golf looked as though he was going to be sick. Christy nodded, taking the skewers of meat from the fire. “Guests first,” she said, handing one to Grey, and that was end of the matter. Golf and Christy talked, but Farwell was looking at the sky, watching the darkness sink in. Grey, for his part, was silent. He ate with abandon, and was surprised to get a second helping when he asked for it. He consoled himself with the thought that he’d carried the deer, at least. Perhaps he deserved as much of it as his stomach could hold. But these people didn’t seem to care much for the idea of deserving or not deserving. They just…gave. And the giving was as different from what Grey was used to as the green-grown ruins were different from the desertish wilds of the Dust Age. Golf cracked a joke that Grey didn’t understand, but which made Christy roll her eyes and Farwell almost spit out his mouthful of meat. Grey was halfway to a smile himself when a sound silenced them all. Grey froze at the sound, old terrors coming to seize his muscles, fingers tightening uselessly around open air. Christy snatched up her rifle and the half-empty jug of water, beginning to retreat to the hulking building behind them in the manner of a soldier doing a drill. “Got your knife?” Farwell asked, fear behind his eyes, and Golf nodded silently, then turned to Grey. “That gun of yours loaded?” he asked, and Grey looked at him blankly for a moment. Over the course of the evening, Grey had started to think of these boys as men. But out here, in the dark with the dogs hacking and howling all around, he saw them right again. Just boys. Frightened, softhearted boys; the Dust Age would have eaten them alive. But the Dust Age was not here. Just its ghosts. And Grey had been haunted long enough. The peculiar baying grew louder, and Grey stood, feeling for the knife at his belt. Gun in one hand, knife in the other. Hoping his hands wouldn’t start shaking. He could drop a couple of the dogs before he had to start hacking at them, at least. And like a flash flood, the dogs were there, pouring down the ramp. In the dull red light of a dying fire, the pack had an unholy look to it, and though Grey had never been a religious man, but he could have used a prayer right then, some sign or gesture to ward off evil. All he had was his gun. Three bullets–the last three bullets–were spent. He didn’t know if any of them hit their mark or not; it was impossible to tell. The crack of a rifle sounded from somewhere above them–Christy, thinning out the pack as best she could. A dog leapt for Grey’s throat, and he stepped out of its way, stabbing at it as it fell. The dogs were swarming, tripping over one another in their eagerness for meat. Grey could hold his own against them–he had before–but out of the corner of his eye, he saw Golf stumble–recover, barely–and knew that these boys could not. Not when the dogs were this desperate, and this many. With a growl of his own deep in his throat, Grey surged into the pack, their bodies bumping against his legs as they tried to turn and snap at him, to bring him down. But Grey was a child of the Dust Age. He did not fall so easy. He hacked at them–it was impossible to miss–ignoring the warm spray that started to stain his hands, his face, as one by one the beasts yelped and fell away, only to be replaced by another. No matter how many dogs he cut down, another was there to jump at him. Teeth sank into his arm, his leg. His world was tiny and panic-tanged and there was blood in his teeth. For the first time since he had stepped out from behind that pillar to be met with a smile, he felt at home. But his arms were growing weak, his feet unsteady, and when the next dog leapt for him, he fell under its weight. The world flashed white for a second as his head cracked against the hard ground, and when his vision cleared, he saw one of them standing on his chest, snarling. He snarled back. Fitting, that the monsters of the Dust Age would kill one another. The rifle cracked again, sharp and clear in Grey’s muzzy-headed world, and the weight on his chest slid off, leaving Grey coughing, spitting bitter liquid onto the ground and trying vainly to struggle to his feet. “Get up!” Golf shouted in his ear, hauling him to his feet and shoving him back, shielding him as another dog leapt at them both. Slashed at it, wildly, and it fell with a yelp. None leapt up to take its place. Grey blinked. Farwell was tearing his blade free of another dog, and one more was fleeing, whining as it went. The rifle cracked once more, and it tripped over its own feet, then went still. They were all dead. Every one. And Farwell was looking across them at Grey, a hint of caution in his eyes. Christy ran out of the building, barreling to Golf to wrap him in a hug, and Grey felt the tiredness in his bones grow. He let the bloody knife in his hand drop to his side, and he stared at it, watching the red drip from the blade to the ground, until a scratch of booted feet against asphalt told him that someone was standing nearby. He looked up to find Farwell giving him a curious look. “You know the dogs,” he said, glancing at the pile of bodies, then back to Grey. “I was there when they were made,” Grey said with a forced chuckle. He condemned himself with the words. But the marks of his past were on his very skin, and he was a fool if he thought he could hide them. He was a ghost, a relic, hard and cruel and useless as the dead city that surrounded them, and these people–they were the green as the life that would grow best when he was gone. But Farwell was watching him, considering, no joke lighting his dark eyes for once. The fire flared up again, the red light turning gold as Golf piled more fuel onto it, and Grey’s head came up as he realized what he’d heard. He’d been resigned to leaving, almost set on it. And now he was standing on the edge of the firelight, with the night behind him and Farwell’s idiotic welcome before–and it was too much. He found himself chuckling again without meaning it. Oh, his hands had been red for a long time. “They got to you,” he noted, nodding to Grey’s leg, where the blood wasn’t drying. The dog-bite was sore and throbbing, and his arm was a mass of pain, and Grey realized that if he did walk back into the dark, he wouldn’t get far. The fire was blazing gold now, terrifying as a sunrise, but the familiar dark was lonely, and that was so much worse. So with stumbling, pain-racked steps, Grey let himself be pulled towards the light. There are more where it came from. Why not take one of these out for a spin? Ahh thank you so much!! I was having a lot of fun playing with the light and dark imagery, and I’m really glad it showed through 😀 thank you for reading!!! This was so good!! I’m really impressed by your storytelling versatility. This is completely different in genre and tone from anything I’ve read from you so far, and it’s just as excellent as your other stories. You pulled off the darker, dystopian tone perfectly! That’s awesome! I just heard a wonderful panel discussion at Realm Makers about short fiction; it really inspired me. I’m planning to write a lot more short works in future. It’s not something I’m particularly good at right now, but I want to develop the skill.